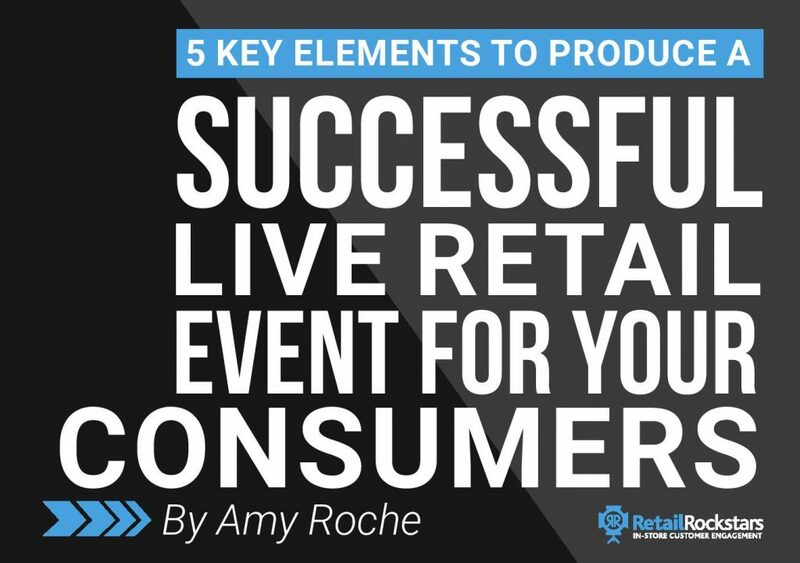 Retail Rockstars Director Amy Roche shares her methodology for creating successful and engaging live retail events, called ‘Experience by Design’. It’s super important when planning a customer retail event to incorporate a bit of both your own personality as well as your resident expert or facilitator (if you are using one). When injecting a ‘local personality’ to a retail event, make sure they’re a good fit for you and your brand. Getting this right for your audience means it will strike a common chord and resonate deeply with them. Don’t forget to keep a consistently localised feel in both your pre and post-event marketing. Retail story telling is very important when conceiving the event, as is developing your actual event story. This is useful, not only for the staff but also for the attendees, because there is a huge word of mouth element after a successful event that can spread like wildfire. The clearer you can be with your narrative, the better people can retell that story for you, so it’s essential that this is in place well before invitations or staff communications. This is the sensory experience, the anchors, the memories and the entertainment your customers get out of attending the event. It’s not limited though to just the experience of the actual event – it’s the impressions before and after the event too. It’s the full event experience journey from start to finish. We have a particular ‘showtime blueprint’ that is used for all our retail events. While each Rockstar or expert will have his/her intellectual property or specific methods they go about educating people, all the Retail Rockstar shows follow a specific recipe that we have created to amplify the results for our clients. Now, the whole point of this post is to help you get started on your very own LIVE events. And, it’s certainly easy enough for you to put this into place within your own store. When running your own events, ensure that your unique brand promise is utilised everywhere from start to finish. This will guarantee that each attendee gets to experience first hand, what you are all about, what you are proud of, and what makes you different from your competitors. This along with the value they’ve received is what turns a standard visit, into something really special and memorable. The ‘mechanics’ of an event are the technologies and tools that help you communicate and register attendees. It is also the technology used during the event, social interaction, hashtags, reporting and email campaigns. All of this should be set up prior to your event being launched. This ensures the event meets its aims, is measurable and tells a succinct and consistent story. It also helps move an event from mediocre to an undeniable success and creates some metrics that you can measure and then refine where necessary. Consistently putting your own unique five elements together, as we did above will create a memorable in-store customer experience, drive customer engagement and sales. Waking up your customers and getting them to not only notice you but to advocate on your behalf will increase future in-store visits and promote better profitability. For more help on increasing your retail visitation check out, “5 Ways To Dramatically Increase Visitation To Your Retail Business“.